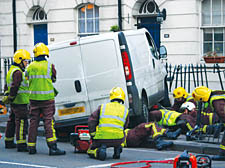 THIS was the chaotic scene in Somers Town yesterday (Wednesday) afternoon after a delivery driver lost control of his van, crashing into railings at the front of a house. Most of Eversholt Street was sealed off while fire crews worked on the smashed vehicle. Fears that the petrol tank might be ruptured by mangled railings caught underneath meant the road was closed for several hours. It is believed the driver suffered a coughing fit and collapsed at the wheel. A London Ambulance Service spokeswoman confirmed a 35-year-old man had been treated at the scene.